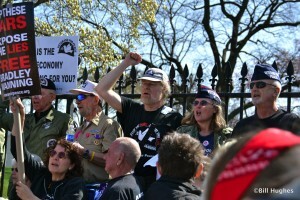 Veterans at the White House fence, March 19, 2011. Photo copyright Bill Hughes. Following are reports from Art Laffin of the Dorothy Day Catholic Worker community in Washington, D.C., about the veteran-led protest and arrests there on March 19, the eighth anniversary of the U.S. occupation of Iraq; from Military Families Speak Out about anti-war arrests in front of Grauman’s Chinese Theatre in Hollywood that same day; and from stopthesewars.org about the following day’s demonstration outside the Marine Corps base at Quantico, Virginia, where alleged whistleblower Pfc. Bradley Manning is being held in solitary confinement. 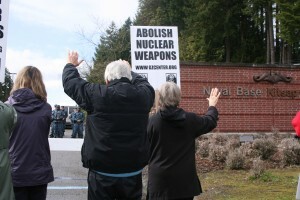 Pacific Life Community activists enter the Lockheed-Martin missile complex, March 7, 2011. Photo by Jim Haber. The retreat culminated with a two-hour vigil at the gate of Lockheed-Martin’s nearby Sunnyvale missile plant. Twelve people representing the faith-based network of activists who are dedicated to “ending nuclear weapons and war making through nonviolent direct action” walked past the gatehouse to bring their message directly to workers. 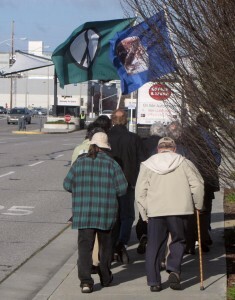 Their path was soon blocked, and when they did not leave, all were arrested. Most were cited and released a short time later; Fr. Steve Kelly refused the conditional release. He was jailed for two more days before being released on time served. Court dates for the others are set in April.